iCloud is a new Apple service for iOS devices that retires Mobile Me service. This service automatically pushes content wirelessly to Apple devices (using same Apple ID). You can enable iCloud services by activating automatic downloading of new purchases (including free) on Apple devices. As of now, you can turn on to activate automatic downloads for Music, Apps, and iBooks on your iOS devices like iPad, iPhone. iCloud is a virtual hard drive space which stores all your music, photos, apps, calendars, documents, and more. 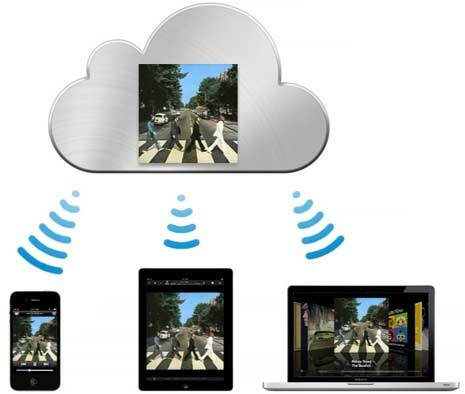 It automatically downloads and copy them to your iOS devices wirelessly. Also, it keeps your email, contacts, and calendars up to date across all your devices. No syncing required or management is required – just activate this service and its all done! 1. On your iOS device, tap Settings icon to open Settings screen. 2. Settings screen will have lot of options. Tap Store option located at the bottom part. Then you will get sign-in screen, if not already logged in. 3. Now you should see screen which reads “Automatic Downloads” with Music, Apps and iBooks set to OFF status. Change the status of all (Music, Apps and iBooks) to ON. 4. If you are using unlimited cellular plan, you may also set cellular option to ON. 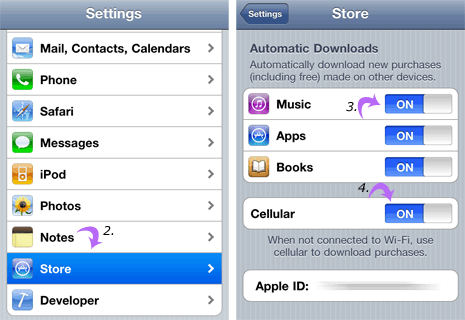 Whenever wi-fi internet is not available for automatic downloads – iCloud service will use cellular mode for downloads. So, if you have strict data limited plan – you may want to keep this option OFF. After the above setup, if you download any music or application on specific iOS devic – it will be automatically pushed and downloaded to other Apple devices using same Apple ID wirelessly. Quick, easy and convinient!